In the world of Country Songwriting, there are a lot of INs, a lot of OUTs, and for one Nashville veteran, there is Dudeism. A 15 year resident of Music City and Ordained Dudeist Priest, Ward Davis has written songs for some of Country Music’s biggest stars for years, but most recently, co-wrote the current Willie Nelson and Merle Haggard single, Unfair Weather Friend. We sat down with Ward to talk about songs, life and Dudeism. Dudespaper: Congratulations on writing the Willie & Merle Single! So I have to ask, how does being a Dudeist Priest play into all this? Ward: Well, first of all, I was ordained on January 25 of this year, so I am relatively new to Dudeism in it’s organized state, but I have always been one to abide and so I think becoming a Dudeist Priest was an eventuality. When the certificate finally came in the mail, I knew I was a complete human being and my craft could only benefit from such an inner peace. 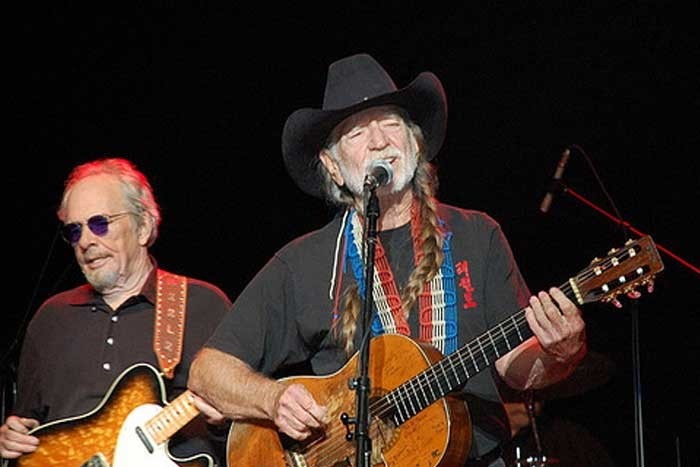 Dudespaper: Specifically though, like, tell me about this song that Willie & Merle recorded. Was it written with Dudeist principals in mind or what? Ward: I like to think I approach every situation in such a way that the Dude would dig. The song, Unfair Weather Friend, is a ballad about the undying bond between life-long friends. It all started when Marla Cannon-Goodman and I were sitting on her patio one fall morning. I was abiding and it was far out. I picked up my guitar, and the fair weather of the morning, brought out the title, Unfair Weather Friend, so we rolled with it. The first version of the song only took about an hour and a half to write. Dudespaper: Were you there when they recorded or how does that work? Ward: No. They recorded it at Willie’s studio in Austin and I was in Nashville. I really didn’t know for sure if they were going to cut it until the last minute. I did get to meet Willie a couple months ago, and we sat and listened to the entire Django & Jimmie, album he and Merle are releasing June 2. Dudespaper: How was that? Does Willie Abide? Ward: Oh yeah…I think Willie is the ultimate Abider. We abided together. I walked on his bus, and immediately felt at home. We sat and listened to music and talked about Johnny Cash….it was really far out…he gave me a joint to take home. I still have most of it. Dudespaper: Right on! So what’s next for Ward? Ward: Well, I’m finishing off an album of my own, 15 Years in a 10 Year Town, that should be out later this year….but I’m really looking forward to achieving in my role as a Dudeist Priest. I’ve been looking into performing some weddings, and with the success of Unfair Weather Friend, I hope to spread the good vibes as far out into the universe as possible. I think with satellite radio, we can do that now. I’d like to see a day when Dudeism and music have totally eradicated the rug-pissers from this planet. My wife and I just conceived so I’m going to have a daughter at the end of this summer. That’s a pretty big deal. Ward: Thanks. It’s not a bummer. She’s going to be my little Dudette. My biggest hope for her, and all Latter Day Dudeists, is that we can take it easy and all abide together, so as to someday become the best of Unfair Weather Friends; like Willie & Merle…Walter & The Dude…like Jesus & Donny. Wow, that’s totally amazing, man! Let Ward be an inspiration to us all, or something like that.